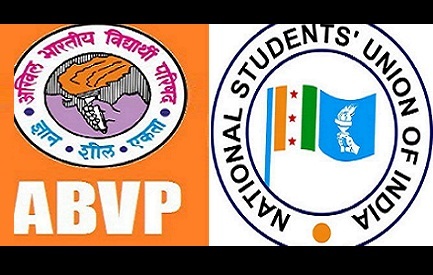 BHOPAL: The Congress' National Students Union of India (NSUI) has performed well though RSS-affiliated ABVP claims to have won at more places in the students' council polls in Madhya Pradesh. ABVP came out stronger in five universities. NSUI did well in Jabalpur's Rani Durgavati Vishwavidyalaya. The ABVP regional organising secretary Prafulla Akant said that ABVP won in 85% of 427 colleges. But NSUI's Vivek Tripathi rejected it and claimed big victory for NSUI. In Bhopal, ABVP did exceedingly well in Barkatullah University and nearly a dozen other colleges but Bhagat Kranti Dal (BKD) trounced it in MVM, the prestigious science college. NSUI won in Benazir College and Sadhu Waswani College. NSUI had claimed that government and college managements were biased against it. It blamed the Janbhagidari groups too for being pro-ABVP. The AAP's CYSS also claimed its first victory. In several towns, there were clashes too and violent incidents during the runup to the students' counil polls. A youth was killed in Jawad town in Neemuch, recently. The students' council elections were held after several years. The elections were stopped after violence in the past.